Geochemist Robert Poreda, an expert in the field of noble gases, was honored earlier this month as a newly elected fellow of the Geological Society of America (GSA). Poreda, professor of earth and environmental sciences, and the other 72 fellows elected by the organization last summer were recognized at the GSA’s annual meeting in Baltimore. One of those challenges occurred in a joint research project with The Ohio State University, Duke University, Stanford University, Dartmouth College, and the University of Rochester to determine the source of natural gas contamination in drinking-water wells associated with hydraulic fracturing. Poreda’s expertise in noble gases was essential in tracing the contamination to the hydraulic fracturing process–most likely due to poor casing and cementing in the wells. 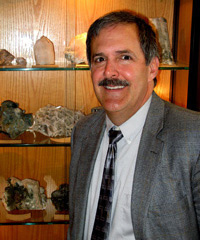 Poreda, who earned his Ph.D. in earth sciences at the University of California, San Diego, wrote his thesis on “Helium, Neon, Water, and Carbon in Volcanic Rocks and Gases.” He remained in San Diego as a postgraduate research geologist and then as an assistant research geologist before joining the faculty at the University of Rochester in 1987. Established in 1888, the Geological Society of America is a global professional society with a membership of more than 26,000 individuals in 115 countries.